Here at JibberJabber Towers we're big fans of travelling around the UK – we're not called JibberJabberUK for no reason! We haven't left the UK for nearly 10 years now and in fact none of us hold valid passports. We like nothing better than packing up the car or getting on a train in search of new sights round the country. Of course having a day out or weekend away in the UK is something many of us do on a regular basis. When it comes to longer breaks then most people will be looking to travel further away especially when it comes a special holiday such as a honeymoon. I can vouch for the fact that the UK has its own charms and shouldn't be disregarded. Some of you might be already deep into your wedding planning whilst others may be celebrating a fresh wedding proposal from the weekend. 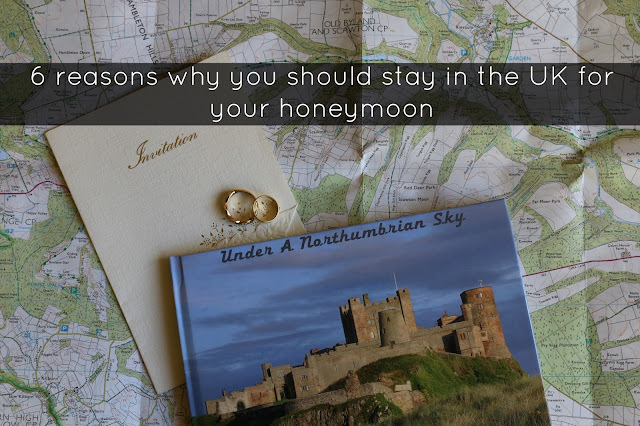 If you're still unsure about the benefits of staying in the UK for your honeymoon then have a read through today's guest post. It's no secret that your wedding will probably rinse your bank account dry and a holiday in the UK allows you to jam more activities into your trip but for less expense. It's a case of booking a hotel room or a cottage for a week, in an idyllic location and then just throwing everything into the car with no baggage fees to worry about – yes, you can take eight pairs of shoes. You probably blew most of your wedding budget on the rings and the photographer, so this is a great way of saving a little cash after the big day. Many people admit to not seeing enough of the main attractions the UK has to offer. Have you been to Stonehenge? Have you experienced the wonders of the Natural History Museum? Have you experienced proper fish and chips on the coast? Or explored the magnificent Edinburgh castle? A UK honeymoon allows you to enjoy being a tourist in your own country and you can even road trip to various destinations throughout your getaway and experience various new places and sights together as newly weds. Let's face it, the UK doesn't enjoy the best weather throughout the year. You might get lucky with a couple of weeks in June, but if you book your stay in a cosy cottage for the week in the Yorkshire Dales, with an open fire and plenty of snacks and food you'll get to spend your honeymoon cosied up and away from everyone to enjoy some alone time as a newly wed couple. 4. We still have beaches! Head south at the right time of year and you might as well be in France, on one of their beaches. Cornwall enjoys soaring temperatures throughout the summer so if you really need to spend some time on a beach during your honeymoon it's worth considering. Here are the best beaches in the UK, according to the Telegraph. The UK is full of romance and beauty once you leave the cities and towns, hence why we had so many writers and poets pen epic novels and poems about the British countryside – the Bronte sisters and William Morris are just two examples. Head north to the Dales and take in the breathtaking views or west to Wales and trek up Snowdon together. Where in the UK do you like to visit? Have you ever considered the UK for a romantic trip? This would have been a great post to see had I gotten married in the UK as my hubby and I originally planned but that proved to be more difficult than it was worth for several reasons (I'm an expat). We got married in Florida and never really got a proper honeymoon but I plan to get one sometime right here in the UK. We are hoping to have a glam one for our third anniversary next year in Bristol at the Royal Marriott! I love travelling around the UK, there is so much to see and do! We went on a weekend getaway at the end of January to Portland Bill for my husband's birthday and are planning to go in August to Leeds for my birthday! So I definitely agree that holidaying here at home in the UK is completely worth it! I totally agree, there is so much to see in our country. You might not guarantee the weather but we always say it's bad clothing, not bad weather! Living so close to Cornwall I can vouch for it being a stunning county, we've holidayed there many many times. Wow 10 years is a long time but England has so much to offer so I agree why not make the most of the country that you live in? ha ha! i have not been on a honeymoon yet. It's something we hope to do when my health is better and will be a great opportunity and there are so many lovely options in England. We had planned to go to Oban for our honeymoon but the hotel cancelled us for renovations quite late on. Luckily out in-laws stepped in and got us another holiday, which was amazing of them. I love UK holidays for all the reasons you've listed. This is an amazing country! Totally agree. England has so much to offer and there are many parts of the country that we'd love to visit one day.